This is the "Gold-leaf Tributary Document from Siam" with highly exquisite binding. Although the word "piao" was the term that Qing dynasty government required that its vassal states use to refer to themselves when writing to the emperors of China, whether the vassal states accepted and approved such position held by China as a heavenly monarchy remain to be deciphered from the content of the piao. On May 26, 1781, Taksin (1734-1782), the king of Siam, sent his envoy on a tribute mission to the Qing government; the list of tribute items, which is currently housed in the National Palace Museum, contains one gold-leaf tributary document, a male elephant, a female elephant, ligumaloes, ambergris, diamonds, Western blankets, peacock feathers, green leather, ivories, rhino horns, Acronychia pedunculata, sandalwood, resin of sweetgum, camphor, bifa, cardamoms, gamboges, chaulmoogratree seeds, ebonies, cinnamons, honey skin, Sappanwood, among others. In addition to these "official" tributes, Taksin also prepared a male elephant, one picul of rhino horns, 100 piculs of ivories, 300 piculs of yangxi, 100 piculs of gamboges, 3,000 piculs of pepper, and 1,000 piculs of Sappanwood; these tributes were excluded from the official list of tributes for fear of the tributes exceeding the tribute limit. Experts generally believe that this "Gold-leaf Tributary Document from Siam" was sent by Taksin. Taksin, who successfully repelled the invading Burmese army, was promoted to the King of Siam. Assuming the post for the first time, Taksin prepared a rather generous collection of tributes to gain the recognition of his sovereign state and to consolidate his political status. 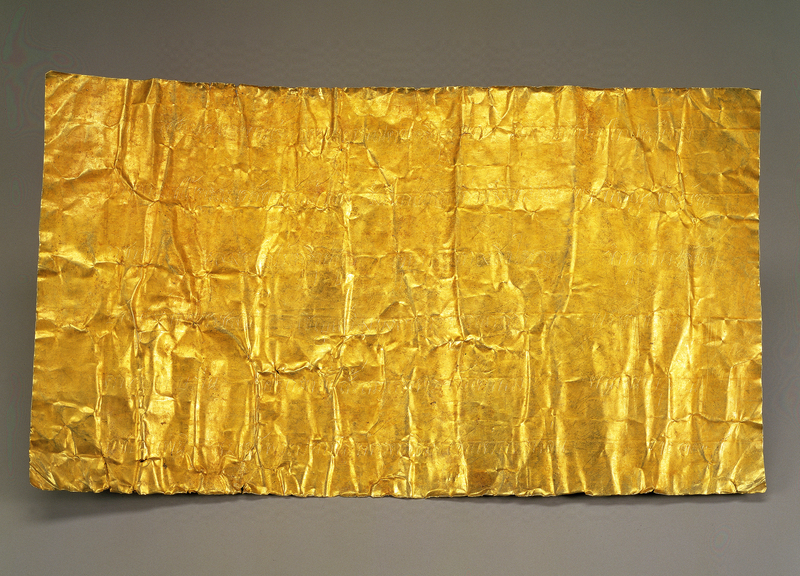 According to the Huojidang of the Imperial Household Department, gold-leaf tributary documents submitted by vassal states were commonly melted by the Qing court to be used for other purposes, making the number of documents remaining extremely low and this existing piece remarkably precious.